Ive read about the issues seperating the lenses on these headlights, so if anyone has any more tips on this thats much appreciated! 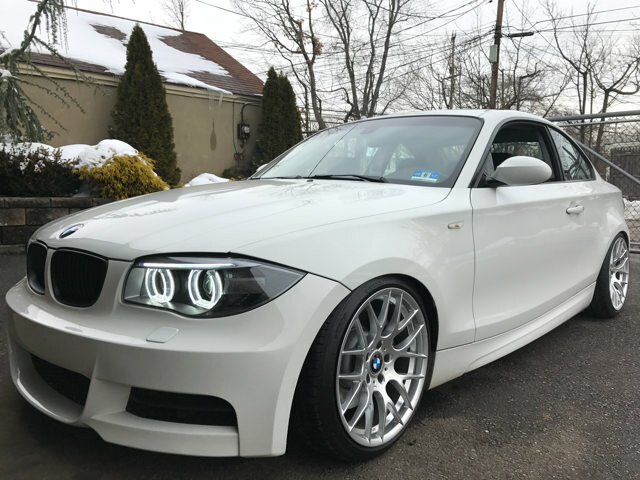 Another option is to buy a set of these lci headlights with the brow and modify these with the dtm rings, assuming these headlights are plug'n'play for my car, anyone know? ‘LCI’ Headlights (with the brow) are p’n’p in all E8X cars. The brow only lights up on the xenon versions, the halogens are just a dummy brow. You’ll face the same issues separating either version of the lights, this issue being the ‘permaseal’ that Valeo use to seal the lenses to the headlight assembly. It’s incredibly tough and makes removing the lenses a real challenge. So I’d save my cash and just open the ones you have. It can be done though, I’ve done a few. WANTED: E8x headlights - all types required, please contact me if you're selling! The brow only lights up on the xenon versions, the halogens are just a dummy brow. Not all OEM Xenons with the brow are light up. But none of the halogens do. I didn't say they did? Hey mate I saw a guy who had an E87 with the flat bottom angel eye rings (not sure if DTM) and he can do this job for people.Not only this he offered to add a lci style brow for around £150 to my pre-facelift E87 that has the xenons from factory. There's a guy on the Facebook 1 Series page called Zimi Van Ende who can do that. If you want someone in the UK, I'd recommend EM Tuning. Avoid someone called Toby-E82 on here, avoid Headlight Retrofits and avoid Never Enough Mods (NEM). ok, thanks for the input. you have a preferred method of seperating the lens? also if i dont buy a new headlight ill still need to get the brow from somewhere, can i even buy that seperately somewhere? SmurfN wrote: ok, thanks for the input. you have a preferred method of seperating the lens? also if i dont buy a new headlight ill still need to get the brow from somewhere, can i even buy that seperately somewhere? I put them in the oven to soften the sealant and then pry them open. Takes a good while and is very tricky. There’s nowhere reputable that produces the brows alone, as far as I’m aware. maybe a possibility to put that behind the sticker or something inside the glass. on the other hand would be a shame to not put the proper brows in if i first open them up. I’ve got the pre-LCI xenons. Only interested in adding the LED brow, not the DTM angels. Best solution? The Zimi Guy will only do them with the DTM angels. Interested to hear who can do that for £150?! Checkout cookiez_customs_ on instagram as he is the one who quoted £150 to add the led brow.